Villatheresa B&B Pisa Centre'. Located in the heart of Tuscany in the charming city of Pisa our guesthouse complete with private English relaxing garden is the ideal choice for your stay in Pisa. Conveniently located in the historical Pisa Centre close to the Railway Station and the airport our guesthouse offers easy access to the entire Tuscany county. We are proud to announce that we have achieved the Certificate of Excellence by TripAdvisor in 2018 too. This prestigious award, reserved to only the 10% of the most appreciated in the world on TripAdvisor, is assigned to the structures that consistently receive high scores by TripAdvisor travelers. Villatheresa B&B is in the San Martino old district of the city, often referred to as the Pisa Historical City Centre and is closed to the Arno River, shopping district, Restaurants,Pizzeria,Pubs and only ten minutes walking to the Leaning Tower. Whether coming to Pisa for business or pleasure our guesthouse is ideal for making your trip a memorable one. Breakfast is served daily in the Orangerie and is included in the room rate. It is possible to rent the garden for private party up to thirty peoples or to rent the 'orangerie' up to ten peoples. Please ask for this directly to the Innkeeper ten days before scheduled time. Villa Theresa B&B provides the perfect environment and support. Villa Theresa B&B offers a wide range of services and care to all who will feel immediately surrounded by jovial and educated at the same time typical of our beautiful country. All the rooms have own bathroom / toilette 'en suite',Electrical Fans, Desk, Hair Dryer, LCD TV, Mini freezer. 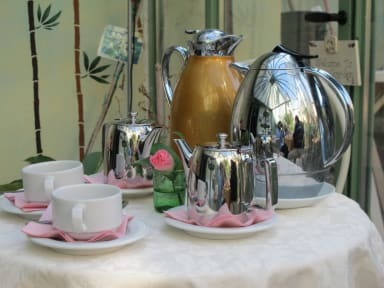 breakfast is served in orangerie is included in the rate.It is not required a minimum staying. Pets are not admitted. Staying for children up to 3 years old is gratis in the same parents,s room. 10% off at conventional and typical Tuscany cuisine restaurants available. Expected arrival time is required to get the keys! Advise If You reach us by car. We have to provide to the permission by Municipal Police for transit and parking in Pisa Historical Centre!. Check in time from 2pm to 10pm. Check out time at 10:30am. We only stayed one night on our way through the city, but wish we stayed longer!! We had the private apartment which had a separate bedroom, kitchen and dining room. Centrally located with your own private entrance. Lovely garden and breakfast in the morning was wonderful. Owner was very friendly and helpful. Waling distance to the tower and the train station. Perfect place and a great value for the price!! Villa Theresa B&B was lovely. It has a beautiful courtyard, a wonderful breakfast, and very nice rooms. We very much enjoyed our stay. Excellent stay. Nothing was too much trouble. Breakfast was lovely with organic yogurt and marmalade made on site, and also a cake baked especially for us. Lovely B & B in central Pisa with great host. After a war welcome we had a great stay and Alfonso was always there when we needed him! A wonderful location and easy to reach. Lovely night's stay at Villa Theresa. Easy access to Pisa as the accommodation is in a central location. We stayed in the apartment owned by the B&B which had facilities to make food and an en suite which was much appreciated. The decor is a little dated and the apartment on the whole is quite dark but was comfortable and tidy for our stay. Alfonso is really helpful and friendly. I stayed in the mini apartment and it was spacious and comfortable. The breakfast was lovely as most of it was homemade! The place is down an alley way which made me wary when coming home at night but it was very well lit and lots of people around in the evening due to the bustling square at the end of the road - so no worries there! Easy access to Pisa and a lovely 15min stroll to the leaning tower.